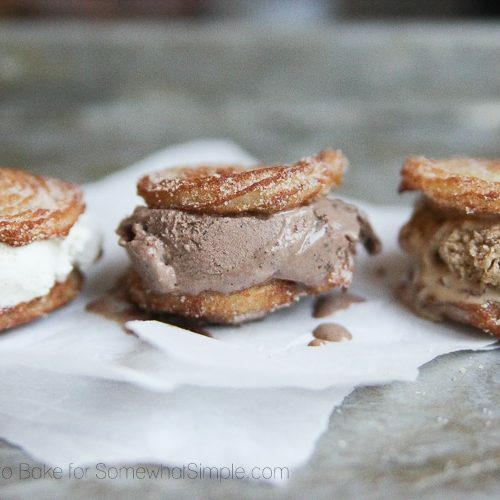 Need a few more ideas to keep your kids entertained while school is out? 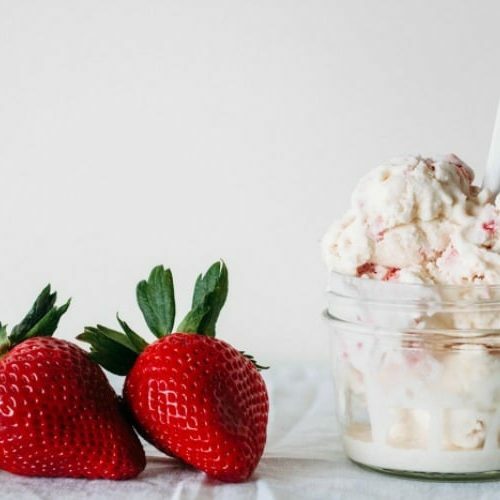 Here are some of our favorite summer boredom busters! I love summer time! 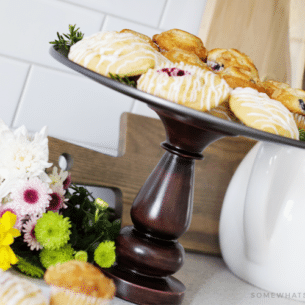 No schedule, no homework, our days are spent at the pool, our weeks are spent traveling… having my kids home is usually so nice. But we all have those days when it seems like we have exhausted all our resources to find something fun for the kids to do! 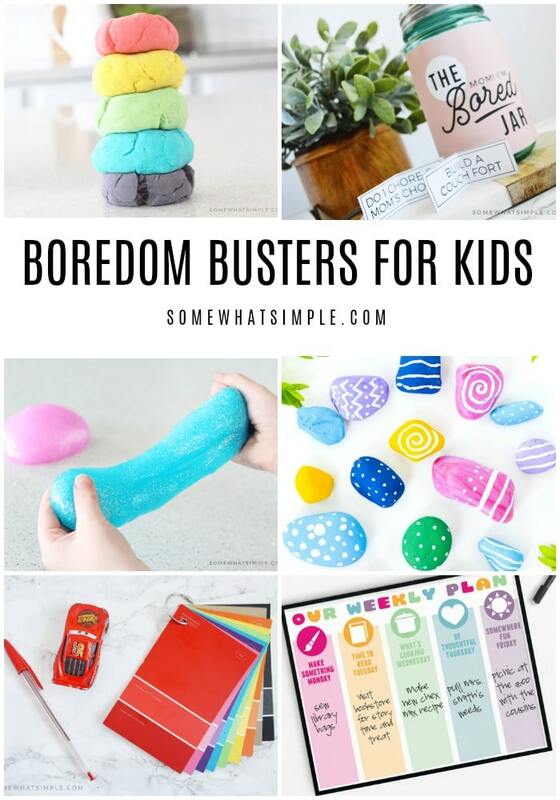 Here is a list of summer boredom busters that will help you manage those times and get through summer without boredom! * All ideas we featured in the video above are linked below. 1. Make a daily Summer Schedule that will guarantee some kind of fun activity each and ever weekday. 2. 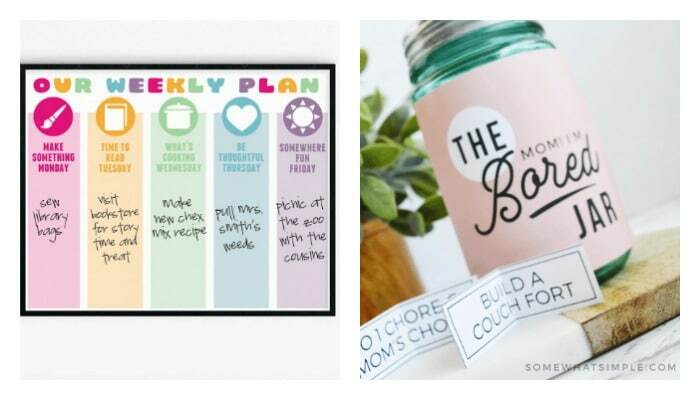 Put together a “Mom, I’m bored” Jar with simple activities (and chores!) for the kids. 3. Pom Pom Fairy Garlands are a fun and simple craft that your little girls will love! From Raising Up Rubies. 4. 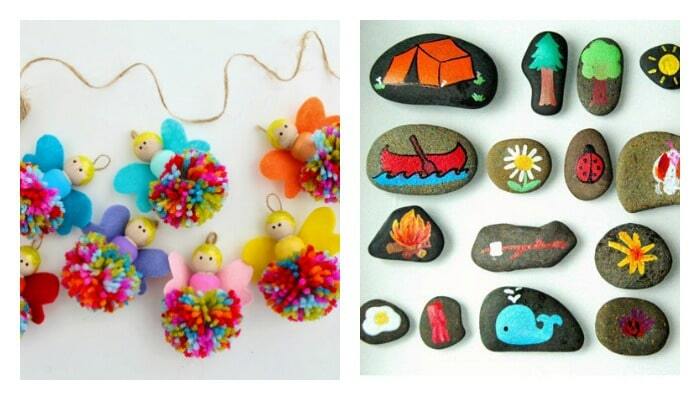 Story Stones are a great way to encourage imaginative play in the form of story telling! 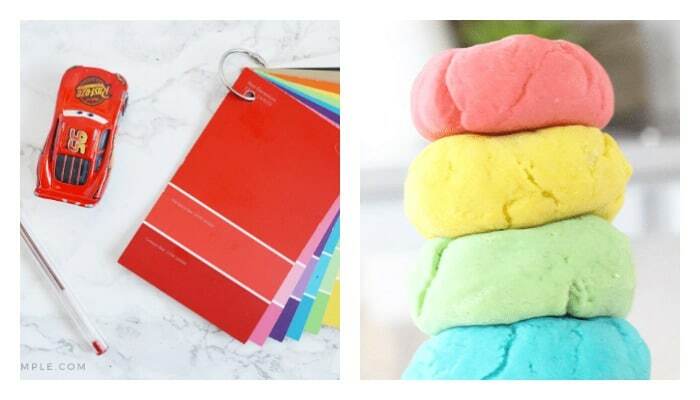 From Playdough to Plato. 5. 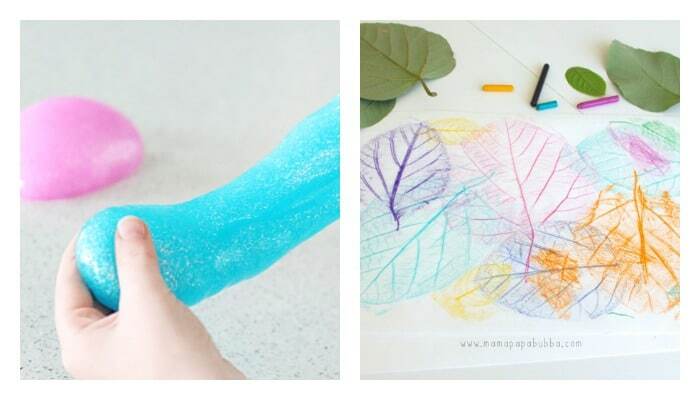 Glitter Slime will entertain for an entire afternoon! 7. A Chip Paint Scavenger Hunt is a great way to have fun inside or outside! 9. 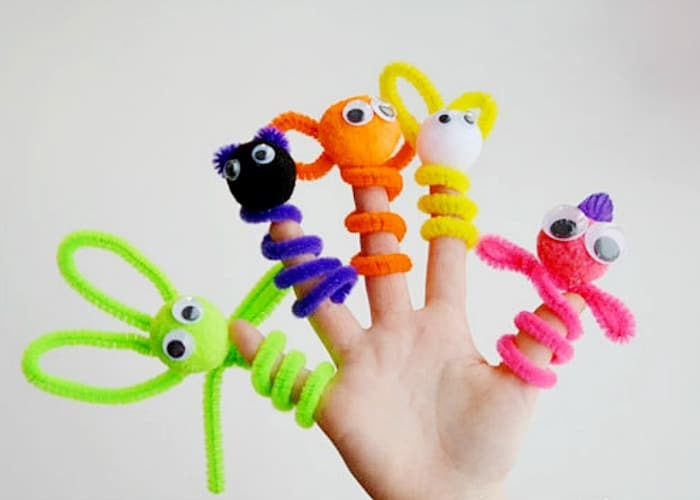 My kids would have a BLAST with these Pipe Cleaner Finger Puppets! From One Little Project. 10. Send the kids outside with some Homemade Sidewalk Chalk Paint and let those little Picasso’s go nuts! From A Pinch of Perfect. Do you have any favorite Summer Boredom Activities? 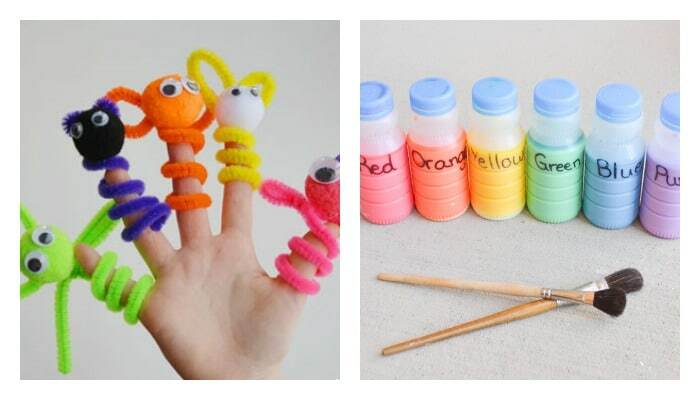 Thank you very much for the free boredom tips…they are so cutie and so creative of you!!! You’re welcome Fatima! Thanks for stopping by! Thank you so much for this post and for your fancy schedule idea! I am at a loss for what to do with my kids all summer and I stumbled across your schedule on pinterest. Can’t wait to use it! I printed out your schedule above last summer & my kids & I had such a blast with it!! It was great for all of us to have some idea of what was coming up. We made a list of ideas for each day at the beginning of the summer so we could refer to it for inspiration. Some weeks we did all 5 days, some weeks we did none, and mostly it was somewhere in between. To keep my older son writing over the summer, I started a blog for him & he posted about each of our activities. We ‘followed the schedule’ over spring break too. Thanks so much for sharing! Thank you for the ideas. After reading a few diffrent blogs it opened my creative side of how to entertain my kids. Here is another ideas you can add. When I was young we wouod always play “pig” with all of the neighbors. I decided to play this with my son as an indoor activity and he loved it. We placed a laundry basket on the couch and used the balls you buy for little kids that are rubbery and filled with air. You take turns trying to make a basket and if you make a basket the other person has to make the basket in the same spot the same way you threw the ball if they make it then its the next persons turn if they miss the shot then they get a letter. The first one to spell pig loses the game. If you miss a shot and its not one that you have to copy it is simply the other persons turn and you do not get a letter. My son is learning sight words so we spelled sight words instead. My daughter is only 2 and she had her own ball and thought it was fun to just try and make baskets she tried some of the silly baskets we did to. And when the weather is nice again we can play it outside with the basketball hoop too. I LOVE the M-F weekly schedule idea! I’m so doing this! Thanks for the inspiration! Thanks Kari! We just started this schedule again this year and my kids just love it! Its nice having something to do everyday! We started geocaching earlier this year. My son loves it too. Lots of fun.